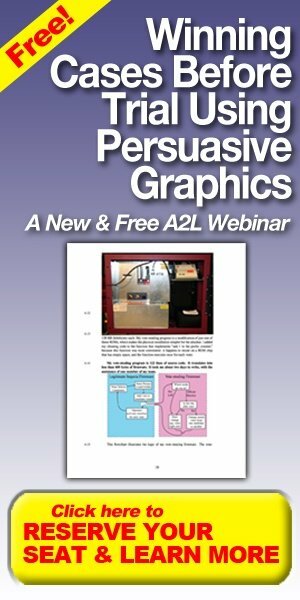 We at A2L are sponsoring later this month a new and exciting webinar entitled “Winning Your Case BEFORE Trial Using Persuasive Litigation Graphics.” Whether you are in-house counsel, outside counsel, or a member of a litigation support team, this 60-minute webinar will prove invaluable and will reveal secrets of persuasion that will help you win cases before trial. The key insight here is that graphics aren’t only for use at trial. They can also be used very effectively in motions and briefs presented to judges, even if jurors will never see them. If you are planning to use graphics to make your argument or tell your story at trial, why not use them at an earlier stage to make your argument convincingly in your brief or motion? In addition, a lawyer who introduces graphics early in a proceeding can lay the groundwork for later use at trial or in another aspect of the case. This can also give the lawyer a sense of how receptive the judge is to the use of trial graphics in the case. Even if you can't make it to the live webinar later this month – it will take place July 29 at 1:30pm EST -- you'll receive access to the recorded version just for registering. The presenter, A2L's Managing Director of Litigation Consulting, Ryan H. Flax, Esq., regularly works with top trial teams to help develop, refine and test storylines and persuasive graphics for briefs, hearings, depositions, ADR, tutorials, and pre-indictment presentations. We hope to see you at the webinar later this month. Click here to reserve your free seat or be notified when the recorded version is available.